Your roof is your home’s foremost line of defense against the weather, as well as an important part of your home’s architectural style. It needs to excel at different roles, which is why it can be tough to choose the right roof material for your home. In this residential roofing series, we’ll talk about the features and benefits of our roofing options starting with a roof material that many homeowners love: slate. 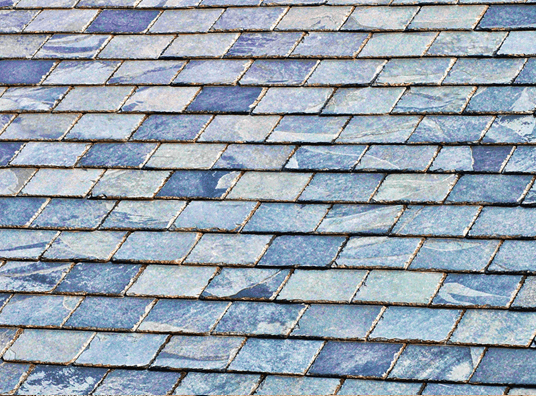 Slate has a unique appeal that many other roofing materials try to mimic. It is unique because no individual piece of slate is alike. In addition, slate grows more beautiful as it ages, meaning that its timeless appeal will work very well with classic architectural styles like Colonials, Victorian style homes, and French Country style homes. Slate, however, requires skill to work with, which is why you should hire an expert roofing contractor in Kent like us to install your slate roof properly. Intense heat and pressure form slate underground. As a metamorphic rock, it is durable, impact resistant and will not saturate with water. It’s impervious to weather and has an expected life span of decades, with many slate roofs lasting for over a century. It’s not uncommon to see slate roofs outlasting their buildings. Slate is a once in a lifetime purchase that will benefit you and your home until the next generation. If you want roofing in Federal Way, WA that will benefit the environment, go for slate. Because it lasts so long, slate helps keep less durable materials out of landfills and reduces manufacturing costs. Additionally, slate’s density adds to your home’s temperature stability. This makes your home more energy efficient, saving you money and reducing your home’s energy consumption. Finally, slate can be recycled once it outlasts a building. Slate has a unique charm that’s unmatched by any other kind of roofing material. It’s also extremely durable and long lasting, making it an excellent investment. For over 25 years, Tedrick’s Roofing has been the best and safest choice for homeowners in Kent and the surrounding areas. We’re experts in installing, repairing, and replacing slate, along with a wide variety of roofing materials. Working with us is the smart choice. Give us a call at (877) 212-9355 to learn more about slate or to get a free estimate.